We Are an Authorized Toro Dealer! 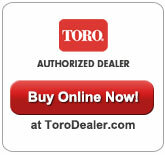 We are proud to be an Authorized Toro Dealer! Come see us today, or browse online by clicking the button to the left, to see our selection of Toro Products.